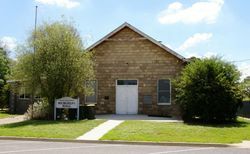 The Memorial Hall was erected to commemorate those from the district who served in World War One. 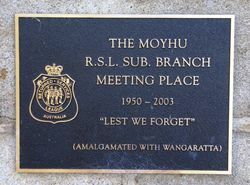 An additional plaque on the hall states that it was the meeting place for the RSL Sub-Branch from 1950 to 2003. Wangaratta Sunday.— The foundation stone of the soldiers' memorial hall at Moyhu was officially laid on Saturday. The township was gaily decorated with bunting and a large concourse of people assembled. The 8th Light Horse band from Wangaratta and Beechworth Town band were in attendance. A company of soldiers and members of the A.L.H. under Lieutenant Chambers, and a squad of boy scouts under Scout-Master R. Dakers, lent a military aspect to the ceremony. The speakers included Colonel H. J. Shannon. Lieutenant-ColoneI A. Mitchell, Lieutenant-Colonel E. T. Searle, Sir John Bowser, and Messrs. B. Jones and R. Cook. The stone was laid by Cr. E. M. Evans, whose two brothers made the supreme sacrifice. Sir J. Bowser said that £14,000,000 had been spent on soldier settlement in Victoria, and the soldiers had paid back £4,000,000, in addition to improvements to their properties, which increased the value and productiveness of the land. He considered that soldier settlement was a magnificent asset to the State. The hall will cost about £1500, in addition to voluntary work of making cement blocks, of which, it will be built. An honor roll of district soldiers will be placed in the building. A silver trowel with an ivory bundle was presented to Cr. Evans by the committee. Age (Melbourne), 3 December 1928. 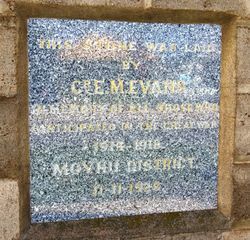 Note: The date on the foundation stone is the 11th November 1928. It appears from the above article that the stone was officially laid on the 1st December 1928.